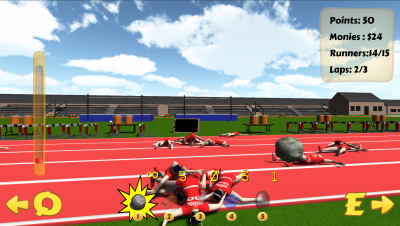 In Track Beat, you play as a track runner hit man, hired by a coach to take out the runners on the other team. 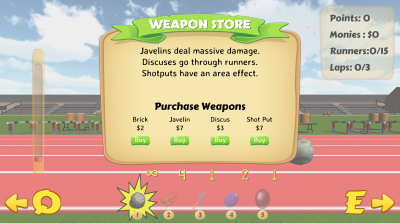 You have access to a variety of weapons to accomplish your mission. 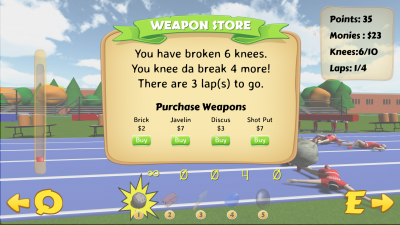 You are tasked with carrying out contracts for each level (taking out a certain number of runners, breaking knees, or take out the star runner). Once a contract is fulfilled, you gain access to the next level. 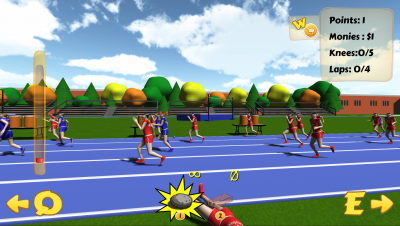 Track Beat is a ridiculous game where you can hone your skill of throwing weapons at people who run across a track. Aim with the mouse and hold down the left mouse button to charge your throw. If you hold it for too long, your power will start to drop from full. You can stop a throw by clicking the right mouse button. With the keyboard, you turn the camera with the Q and E buttons, ready weapons using the 1-5 number keys, while pressing W will open a window that allows players to buy more of the special weapons available. Each level has a limited amount of laps and runners that spawn. Within those laps, you are set with taking out a certain criteria that unlocks the next level. If failure comes up, the level can be easily restarted from the pause menu that is accessed by the escape key. There are a total of six levels in all.